The world of possibilities in the automotive world is endless. Consider all the potential cars, multiplied by all their different eligible preparation levels and classes- the quantity is staggering. Only a tiny percentage of these avenues are ever fully explored and the introduction of new cars and new classes only ever serves to increase the number of unanswered questions. Many texts exist on the workings of vehicles, their suspensions, and how to design and tune them to work better. From great starter books like Herb Adams' "Chassis Engineering", to Paul Van Valkenburgh's "Race Car Engineering and Mechanics", all the way up to the Milliken & Milliken tome "Race Car Vehicle Dynamics". If you can get through all of these books with a good understanding of their content, you'll be in a good position to make any car you're in the best it can be. If you're in the same car everyone else has, that, and a top driver, may be all you need. If you see an already semi-competitive vehicle out there already, and know you could tune and drive it to a much higher level than its current owners, then that's another way to get into a top-flight platform without doing much research into car selection. And that's the one big piece missing from all these books. It's the thing you need before you start suspension tuning, tire selection, and driver adaptation - what car do you choose? In a spec class or series the choice is made for you; maybe an existing manufacturer sponsorhip makes it moot, but in the majority of cases, the race team director has some freedom in this selection, and the fate of every effort put forward afterward hinges on that choice being a good one. The tuning books all assume you've already made up your mind on the car to race, and don't really provide any direct guidance in the matter. There are so many different things to look at with our cars - weight, horsepower, suspension design - how are we to know how two different ones will compare? If we'd like to campaign something nobody has tried before, how do we know if we'll even be in the ballpark, much less in a position to vie for a championship? There are three key elements in a fast race entry - the driver, the car, and its tires. For many, tires are just considered part of the car, but they are so important, they can overshadow everything else. The above books all start out with an explanation of tires, because of their huge importance in the overall formula, and their importance will be reinforced in this series. While those books also reference the driver and at times provide suggestions on setup with an eye towards making the car easier to drive well, the subject of driving is covered in a different set of books and won't be discussed much here. When we race our automobiles, we ask them to do a lot of different things. Our cars have to accelerate (sometimes from a dead stop), turn, and stop, repeatedly, in a precise and controllable fashion, where every tenth or hundredth of a second counts. Compare it to something like the Olympics - whether it's dodging cones around an autocross track or ripping up a big proper roadrace track, our machines face an array of challenges as wide as those faced by a decathlon competitor. Every time we compete with our cars, we are entering a 7-event "Septathlon" if we have a drag-race start, or 6-event "Hexathlon" if we don't. Unlike the ten events of an Olympic decathlon, each equal in weight, we are faced with a different balance of challenges with each track or autocross course we encounter. Just like our athletes, our cars are going to have their strengths and weaknesses. When considering a new car entry for a class, it is extraordinarily unlikely our choice will be better than the current top competition in all seven events. Unless, perhaps, the only reason that car hadn't been campaigned before was because nobody could afford it. It is most likely our car under consideration will be superior in one or two events, equal in several, and inferior in just as many, if not more, than it had an advantage in. In taking a chance on an unproven platform, we are making a gamble - that the benefit we will see from our increased capability in those one or two events, will more than make up for the deficiency we'll suffer in one or two other events. Through this process we hope to make this gamble as educated and low-risk one as possible. Note: One thing we want to be sure we don't do, is pick a car that will be worse in *all* events! It seems obvious, but I see it happen all the time. Now, with the initial dissection into seven events of our competition, we are left to compare on an event-by-event basis, how our choice will stack up to the current front-runners if they exist, or the other options, if the class is new or not yet fully established. When this analysis is complete, we will have a pretty good idea how our choice stacks up in each of the events. The overall competitiveness of the car will be dependent upon how our races balance their challenge - if we are lucky enough to race our an autocross course or track (going to call this "track" going forward to save words) that accentuates our vehicle's strengths, then we ought to end up on top. Days where we're dealt tracks that accentuate our weaknesses, we hope to stay in the hunt - we can't expect to come out way ahead, but we should still be in the mix and in a position for the overall win or championship. Once our choice in car is made, our goal is to be able to accentuate its strengths and minimize its weaknesses, to produce a car that is faster overall than the existing top dogs. When we arrive at a new track, we should be able to point to some place, and know confidently, "I'm gonna hurt 'em right there." At the same time, we should be able to identify other places where our car is at a disadvantage, and plan to drive in a way that minimizes the impact of that disadvantage. Each of the seven events will be covered individually in seven chapters to follow. I've attempted to arrange them in an order of gradually increasing complexity, to give the reader time to adapt to the methods and logic used. Many of the concepts will be old-hat to those that have studied tires and vehicle dynamics but for others it may be all new, so I'll try to take it slowly. The goal isn't to explain how suspensions work, or tune your car to be balanced, or stuff like that - the other books listed above are great references in those matters. We'll be taking a much more high-level approach, and looking more at how the immutable physical characteristics of the car play a role in each of our seven events. A feature that's a detriment in one event, may be a boon in another - there is little that is all bad, or all good. Along the way I may inject some of my opinions on setup, and my own beliefs about what goals are more valuable in the tuning process than others. Along this journey, we are going to assume you know how to tune your car, and so when we're comparing two different cars, we are always doing so with top drivers in fully prepared and tuned cars. This process will illustrate to some extent how different platforms can actually limit tuning options. Because we are not going into suspension type or geometry, another assumption is that the cars under review are able to equalize these variables in the state of tune under which they're being compared. For some this will be a big red flag, for they believe things like "a strut suspension will never be as good as a double-wishbone suspension" and things of this nature. I will attempt to address these things along the way but for now, consider that this comparative process is best used when the cars in question are operating under a ruleset that allows them to achieve desired alignment settings at the limit, and that they have no unresolved glaring dynamic deficiencies, like lack of a limited slip differential. In the SCCA autocross world, this might work in the Street Touring, Street Prepared, or Street Modified categories, possibly also in a class like Super Stock or C Stock. The basis of the comparisons figures that the cars in question are able to get everything out of their outside tires when in a corner, or at least the same relative amount. This comparative process might not work as well in other classes, where cars end up being equal because one car has big power but horrible alignment, another has great suspension and no power, another has bad suspension but big tires, another has bad suspension, limited power, but AWD, etc. Those sorts of classes are tricky because it is difficult to quantify the impact of limited front camber, lack of a limited slip, fwd vs. rwd vs. awd, etc. My hat is off to people like those on the SCCA's Stock Class Advisory Committee, put in the unfortunate position of having to evaluate cars like this. It's got to be tough. One concept to present now, is that of the "friction circle". The friction circle is the theoretical graphical circle, depicting the maximum accelerations (acceleration isn't just forward in a straight line - a turn is considered lateral acceleration, and braking can be considered negative acceleration) in all directions. A good driver will be able to keep his car at its absolute limit for every moment on the course - and a great driver will be able to combine that adherence to the limit, with the precise timing and positioning that results in an optimum lap time. Since we're not going to be worrying about the driver, our job then in choosing the car, is to put it together in a way that gives it a larger friction circle, in at least some areas, than the competition. Smaller vehicle size will produce better times given an equivalent friction circle but we'll get to that later. This graph, like most "g-g" or friction circle graphs, has longitudinal (accelerating and braking) on the up/down or "Y" axis, and lateral acceleration (turning left and right) on the "X" axis. 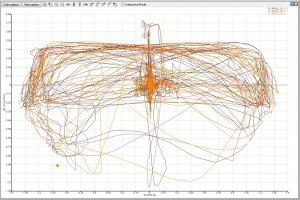 The three colored lines represent three different runs. These happen to be me driving my 240sx in STS trim, on Day 2 of Nationals 2006. This was a 2655lb. RWD car with 170lb. driver, 54% front weight distribution, and 225/45-17 street tires on 7.5" wide wheels at all four corners. This was Friday at Nationals, so the surface grip was very good for what it was, an asphalt lot at Heartland Park Topeka. The more dense an area is with lines, the more time the car spent at that place on the g-g circle. A really good driver will have little to no time spent "inside" the circle (or acorn). 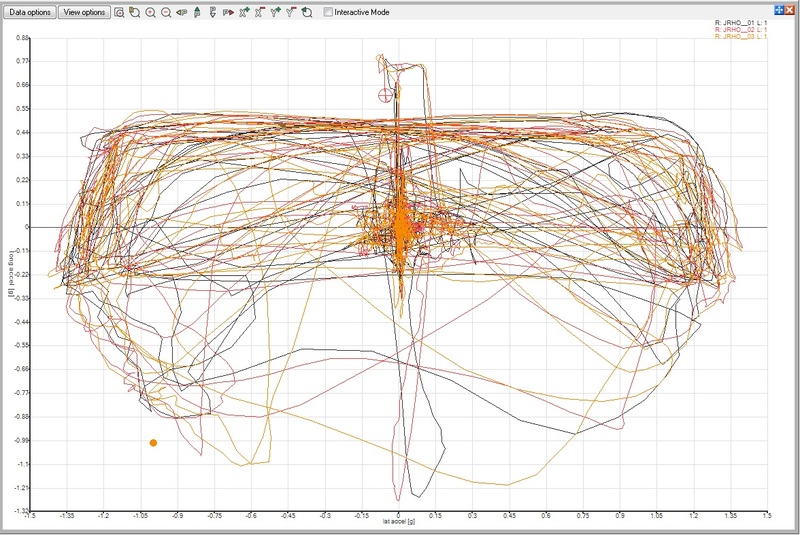 You may notice this graph has a lot of time spent near the center, especially in orange - that is time spent idling in grid and rolling up to the start line. If that data were removed it'd be much more empty at its center. The other thing you may notice is the absence of one of our events - namely #4, transitions. Transitions involve some bouncing around the friction circle which would muddy the image a bit, and they aren't really a single "pure" acceleration the way the other six are. Transitions in their purest form are like pure skidpad, but alternating side-to-side. We'll go into a lot more detail on transitions in the transitions chapter . Depending on the makeup of a track, we may not spend any time passing through the middle of the circle, or we may pass through it several times. A transition from pure acceleration to pure braking, for instance, is bound to take one through the center of the circle. On those trips the driver needs to be aggressive enough with their inputs so as to minimize the amount of time not at the friction circle's edge, but also not be so aggressive they lock up tires or otherwise miss reaching the circle's edge on its other side. Similarly, a transition from full-left to full-right lateral acceleration will take one through the middle. 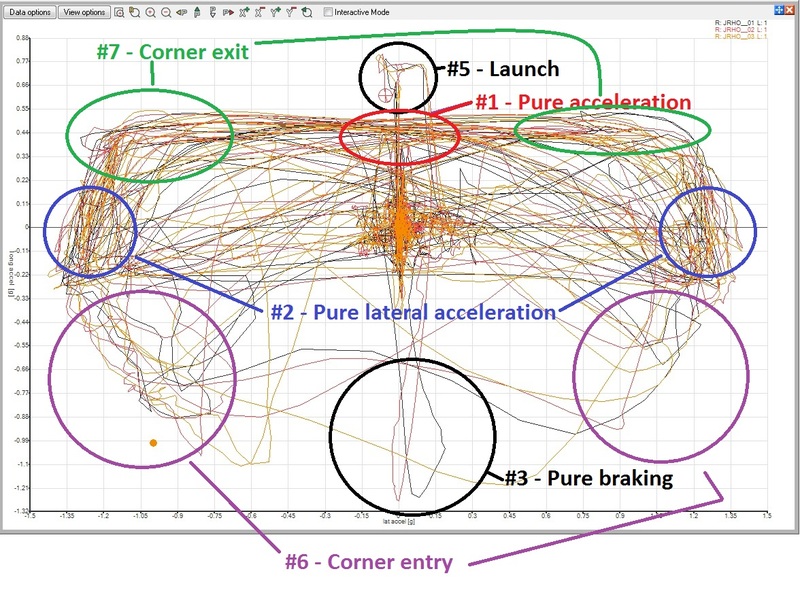 In the next chapter we'll go through a complete autocross run using data and video, showing how the different events manifest themselves on course. I don't have equivalent data and video from any track events although in general on the track, you tend to stay at spots on the friction circle longer, and move around its edge more slowly. That's not to say track driving is "slower" than autocross, just that the speed and frequency of inputs to the car is generally much lower. In some ways it makes track performance easier to evaluate, since in autocross the car is constantly moving between states or events, never staying in one mode for than maybe a second, making it difficult to say what percentage of a lap was spent doing any one given activity. 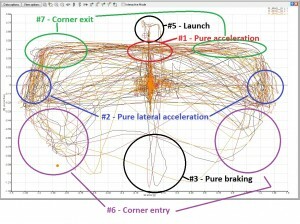 Within both the autocross and roadrace circles, people like to characterize tracks as a "Power track" or a "Handling track" or any number of other descriptors, seemingly referring to the sort of car that would do well there. Equipped with our data and video, perhaps we can arrive at our own detailed understanding of a given track that transcends these basic classifications.